In homes and school communities nationwide, there is re-energized interest in the values of community, compassion, and tolerance, and in finding our way to a kinder culture—a culture that starts with our families. Headlines speak of hate crimes, intolerance, and us-versus-them divisiveness. Recent political events have left many Americans yearning for unity, respect, and compassion in our national discourse. In our schools, bullying continues to be a pervasive problem, and in our homes, "screen-time" poses a constant threat to 'family time.' Research shows that connection and social engagement are key to successful, fulfilling lives, and yet we have never been less connected than we are now. Perhaps more than any other group, parents recognize the potential damage of this trend. Children who are raised in a culture where giving and compassion are valued become happier and more positively engaged with those around them. They are less likely to treat others disrespectfully. With increased concern about meanness and bullying, you may be among the many parents who see the need for more civil, respectful, and considerate behavior among our children. Why kindness? That's a good question. Here's the short answer: because kindness leads to a lot of other good things like compassion, happiness, future success, better relationships, improved self-esteem, and good mental and physical health. And don't we all want that for our children, our families, and our community? In this chapter, we'll look at the research that supports the specifics of the longer answer. So how does nurturing kindness in our children make for happier kids, more harmonious homes, and a healthier society? As we will discuss further, empathy is one of the foundations for kindness. Empathy is the connection with another person that enables us to experience what he or she is thinking or feeling. Children as young as eight months old respond empathically when witnessing their mothers in distress. In one study, researchers reported: 'all of the infants showed genuine empathy in emotional and cognitive ways. '1 In research-based community programs designed to foster social and emotional sensitivity in very young children, such as Roots of Empathy, empathy is taught by focusing on feelings of others. This important skill helps make for happier homes and families. Through these programs, families from different backgrounds get to spend time together in a natural way. If you have been book shopping over the past several years you won't be surprised to know that the field of happiness is thriving. What you may not know is that psychologists have been studying happiness for many years.2 In the last thirty or so years, these scientists have begun to examine what makes people happy, thrive, and flourish. 'Research shows that performing positive activities such as expressing gratitude and doing acts of kindness boosts happiness. '3 Although much of this research has been with adults, children are now becoming the focus of more studies. One recent pioneering study with nine- to eleven-year-olds underscored the benefits to children who perform acts of kindness on a regular basis. The researchers found that these children, in addition to seeing positive changes in their academic experience, were more socially accepted. You could probably have guessed that those might be some of the benefits to the individual child; they are obvious. What may be less obvious is the benefit to their entire community. From engaging in acts of kindness, these children tend to be more inclusive and less likely to bully others as teenagers.4 By nurturing our children to be kind, we are taking the first step in building happier, more harmonious communities. In various studies to support this, scientists notice changes in the brain when people think good thoughts, do kind acts themselves, or even observe other people performing kind acts. Endorphins or 'feel good chemicals' are secreted in our brain; these secretions improve our mood. Another important hormone in this process, and one that is directly related to social connection, is oxytocin. It works in concert with serotonin, one of the endorphins released in the helper's high. 'When it is operating during times of low stress, oxytocin physiologically rewards those who maintain good social bonds with feelings of well-being. '8 Another interesting aspect of this hormone is that when it is released during a stressful or painful time in someone's life 'it may lead people to seek out more and better social contacts. '9 It is pretty amazing that we now know that when people are looking for ways to feel better when they are stressed or in pain, helping others will help them, too. Through MRI scans, researchers can see that when you help someone, a specific region of your brain lights up. This gives you a feeling of 'warm glow' that underscores the emotional benefits to kindness. The growing research on children in schools gives us insight into the positive effects they experience when helping others. Over the past twenty-five years, Service Learning (SL), has become a popular and meaningful way that students of all ages can become engaged in community service through their schools. Barbara Jacoby, a leader in the field of Service Learning, defines it as 'a form of experiential education in which students engage in activities that address human and community needs together with structured opportunities for reflection designed to achieve desired learning outcomes. '11 There are positive results about the effects of service learning programs on young people. 'Students participating in SL programs demonstrate significant gains in five outcome areas: attitudes toward self, attitudes toward school and learning, civic engagement, social skills, and academic performance. These findings bolster the views of educators who posit that SL programs can benefit students at different educational levels in several ways. These multiple benefits include such areas as enhanced self-efficacy and self-esteem, more positive attitudes toward school and education, an increase in positive attitudes and behaviors related to community involvement, and gains in social skills relating to leadership and empathy. '12 Students who experience these gains understand firsthand the value of kindness and connection which enables them to be contributing members of their communities. Sounds good to us! There are so many reasons that kindness is important. At its essence, kindness allows us to develop awareness of and sensitivity to others. Having concern for others and being able to show that concern through our thoughts and actions will help us feel connected to those around us. This is not a new phenomenon. It was Charles Darwin, who, within the context of survival mechanisms, understood that we have an instinct to be sympathetic and caring. '13 To respond compassionately to someone else, we need to observe and understand what they are experiencing. In his book, The Altruistic Brain, Dr. Ronald Pfaff states, 'how scientifically reasonable it can be to rely on the idea that we are wired from infancy to 'do the right thing'.14 Even though we are hardwired for it, we need to work at it. With practice we can get really good at acting with kindness. … Cont'd…. 1. Ronit Roth-Hanania, Maayan Davidov, Carolyn Zahn-Waxler, 'Empathy Development From 8 to 16 Months: Early Signs of Concern for Others' Infant Behavior and Development Volume 34, Issue 3, (2011): Pages 447–458. 2. Psychologists such as Martin Seligman, Daniel Siegel, and Emiliana Simon-Thomas are leaders in this field. 3. Kristin Layous, Hyunjung Lee, Incheol Choi, and Sonja Lyubomirsky, 'Culture Matters When Designing a Successful Happiness-Increasing Activity: A Comparison of the United States and South Korea,' Journal of Cross-Cultural Psychology, 44 (2013): 1294–1303. 4. Kristin Layous, S. Katherine Nelson, Eva Oberle, Kimberley A. Schonert-Reichl, and Sonja Lyubomirsky, 'Kindness Counts: Prompting Prosocial Behavior in Preadolescents Boosts Peer Acceptance and Well-being,' PLoS ONE, 7, e51380 (2012). 5. Lalin Anik, Lara B. Aknin, Michael I. Norton, and Elizabeth W. Dunn. 'Feeling Good about Giving: The Benefits (and Costs) of Self-Interested Charitable Behavior.' Harvard Business School Working Paper, No. 10–012, August 2009. 6. 'Allan Luks' Helper's High,' 2010. http://allanluks.com/helpers_high. 7. Baraz, James and Alexander, Shoshana. 'The Helper's High,' 2010. 8. Tori DeAngelis, 'The Two Faces of Oxytocin: Why Does the 'Tend and Befriend' Hormone Come Into Play At The Best And Worst Of Times?' Monitor on Psychology Vol 39, No. 2 (2008): page 30. 9. Tori DeAngelis, 'The Two Faces of Oxytocin: Why Does the 'Tend and Befriend' Hormone Come Into Play At The Best And Worst Of Times?' Monitor on Psychology Vol 39, No. 2 (2008): page 30. 11. Jacoby, Barbara. Service-Learning in Higher Education: Concepts and Practices. (San Francisco, C.A. : Jossey-Bass, 1996). 12. Christine I. Celio, Joseph Durlak, Allison Dymnicki, 'A Meta-Analysis of the Impact of Service-Learning on Students,' Journal of Experiential Education Vol 34, Issue 2 (2011): 164–181. 13. DiSalvo, David. Forget Survival Of The Fittest: It is Kindness That Counts. Dacher Keltner Interview by Scientific American, 2009. ©2018 Dale Atkins and Amanda Salzhauer. All rights reserved. 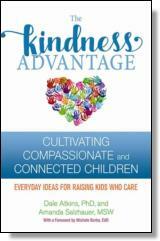 Reprinted from The Kinds Advantage: Cultivating Compassionate and Connect Children. No part of this publication may be reproduced, stored in a retrieval system or transmitted in any form or by any means, without the written permission of the publisher. Publisher: Health Communications, Inc., 3201 SW 15th Street, Deerfield Beach, FL 33442. Amanda R. Salzhauer, MSW, has worked as a social worker in clinics and private practice. She has been a member of several nonprofit boards, including Riverdale Neighborhood House and the Board of Overseers for the Dartmouth Center for Social Impact. She has three children and lives in New York City.